"One of Japan’s most thoughtful and innovative writers, Nakako Hayashi has been single-handedly directing Here and There since its first issue in 2002, asking many of the people who were involved with the early issues of Purple and Purple Prose to contribute. Nakako is also a mother, and the themes of Here and There come from her life experience — 'Unexpected Traveling,' 'Blue Moments' — things that tend to reflect raw beauty more than gloss." 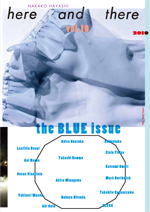 Susan Cianciolo, Artforum International, Top Ten, February 2011.